Volcanoes erupt when magma rises through cracks in the Earth's crust, but the exact processes that lead to the melting of rocks in the Earth's mantle below are difficult to study. In our paper, published today in the journal Nature, we show how it is possible to use satellite measurements of movements of the Earth's surface to observe the melting process deep below New Zealand's central North Island, one of the world's most active volcanic regions. The solid outer layer of the Earth is known as the crust, and this overlies the Earth's mantle. But these layers are not fixed. They are broken up into tectonic plates that slowly move relative to each other. It is along the boundaries of the tectonic plates that most of the geological action at the Earth's surface occurs, such as earthquakes, volcanic activity and mountain building. This makes New Zealand a particularly dynamic place, geologically speaking, because it straddles the boundary between the Australian and Pacific plates. 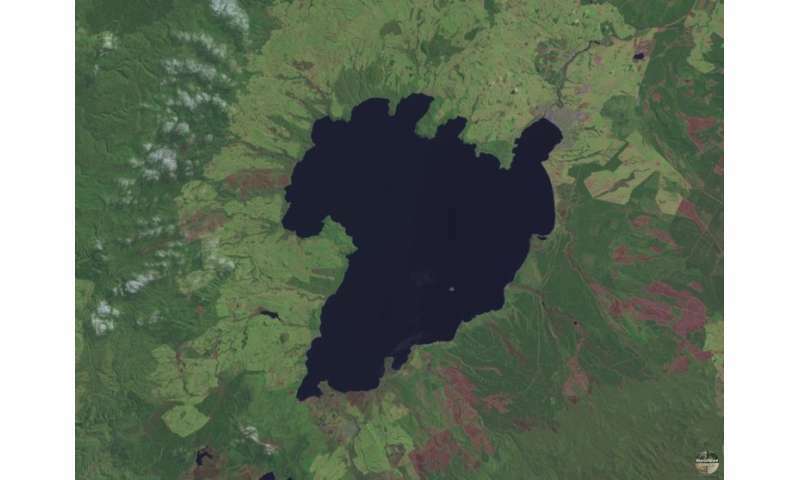 The central region of the North Island is known as the Taupo volcanic zone, or TVZ. It is named after Lake Taupo, the flooded crater of the region's largest volcano, and it has been active for two million years. Several volcanoes continue to erupt regularly. The TVZ is the southern tip of a zone of expansion, or rifting, in the Earth's crust that extends offshore for thousands of kilometres, all the way north in the Pacific Ocean to Tonga. Offshore, this takes place through sea floor spreading in the Havre Trough, creating both new oceanic crust and a narrow sliver of a plate right along the edge of the Australian tectonic plate. Surprisingly, this spreading is going on at the same time as the adjacent Pacific tectonic plate is sliding beneath the Australian plate in a subduction zone, triggering some of the major earthquakes in the region. Sea floor spreading results in melting of the Earth's mantle, but it is very difficult to observe this process directly in the deep ocean. 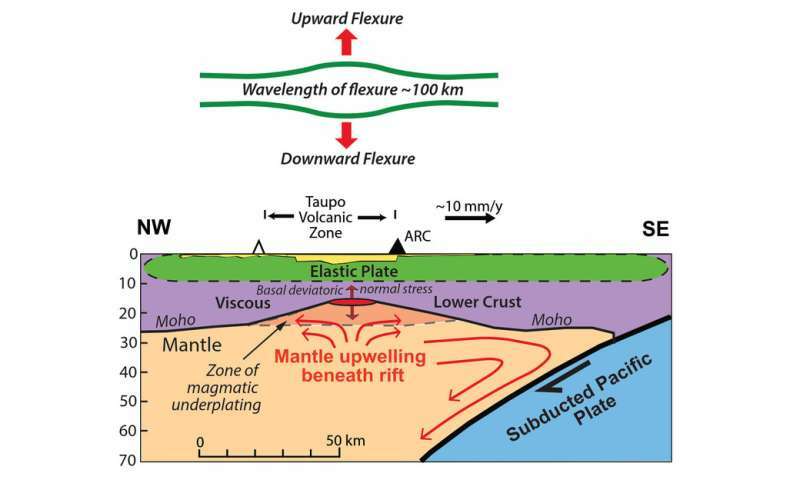 However, sea floor spreading in the Havre Trough transitions abruptly onshore into the volcanic activity in the TVZ. This provides an opportunity to observe the melting in the Earth's mantle on land. We have tackled this problem using data from Global Positioning System (GPS) sensors, some of which form part of New Zealand's GeoNet network and some that have been used in measurement campaigns since 1995. The sensors measure horizontal and vertical shifts in the Earth's surface to millimetre precision, and our research is based on data collected over the past two decades. We found that the pattern of contraction and subsidence, together with expansion and uplift, in the context of the overall rifting of the TVZ, could be explained by a simple model that involves the bending and curving of an elastic upper crust, pulled downwards or pushed upwards by an underlying vertical driving force. The size of the region that is behaving like this, extending for about 100 kilometres in width and 200 kilometres in length, requires this force to originate nearly 20 kilometres underground, in the Earth's mantle. When tectonic plates drift apart on the sea floor, the underlying mantle rises up to fill the gap. This upwelling triggers melting, and the reason for this is that hot, but solid, mantle rocks undergo a reduction in pressure as they move upwards and closer to the Earth's surface. This drop in pressure, rather than a change in temperature, begins the melting of the mantle. But there is another property of this upwelling mantle flow, because it also creates a suction force that pulls down the overlying crust. This force comes about because as part of the flow, the rocks have to effectively "turn a corner" near the surface from a predominantly vertical flow to a predominantly horizontal one. Experimental studies have shown that the viscosity of rocks deep in the Earth is very sensitive to how much molten material they contain, and we propose that changes in the amount of melt provide a powerful mechanism to change the viscosity of the upwelling mantle. If mantle rocks don't contain much melt, they will be much stickier, causing the overlying crust to be pulled down rapidly. If the rocks have just melted, then this makes the flow of the rocks runnier, allowing the overlying crust to spring back up again. Using GPS, we can not only measure the strength of the suction force, but we can "see" where, for how long, and by how much the underlying mantle is melting. This melt will eventually rise up through the crust to feed the overlying volcanoes. This research helps us to understand how volcanic systems work on a variety of time scales, from human to geological. In fact, it may be that the GPS measurements made over just the last two decades have captured a change in the amount of mantle melt at depth, which could herald the onset of increased volcanic activity and associated risk in the future. But we don't have measurements over a long enough time period yet to make any confident predictions. The key point here is, nevertheless, that we have entered a new era whereby satellite measurements can be used to probe activity 20 kilometres beneath the Earth's surface.